Bonnie Murray is one of three candidates for the Hoboken City Council in the second ward. Portion of Bonnie Murray's actual filed ELEC report. Murray's ELEC shows funds of $1250 and expenditures of $250. This conflicts with second hand reports of t-shirts and flyers but there's been no major campaign effort witnessed. For example, there's been four mailers received in the second ward to date from council candidates. Two each have come from Tiffanie Fisher and Peter Biancamano. Third party candidacies are often interesting and unique in American politics and have a role in Hoboken. In this instance however, it's unclear what Bonnie Murray's unique calling card is if she's running on an idea unrepresented as a matter of policy. Some critics feel this is not a real run but since her husband is a twice failed Board of Education candidate aligned with the Carmelo Ticket previously, her council run is more about detracting votes from Tiffanie Fisher as an Old Guard favor. Ms. Murray says she wants to move away from factional politics in Hoboken. Lots of candidates share that view, most recently mouthed by Ruben Ramos. 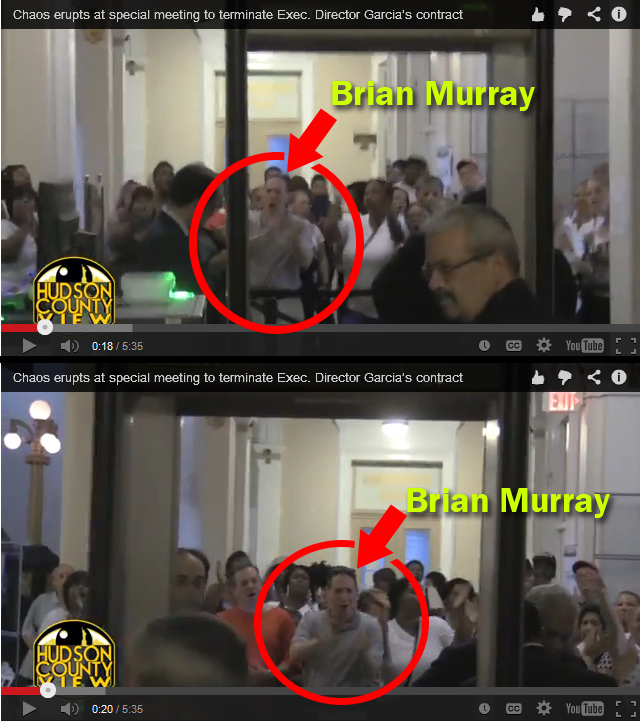 Ms. Murray should know Ramos' positions/history as she attended his kickoff event. All of which leads many to conclude, third party candidacy or not, Bonnie Murray's stealth candidacy serves only to aid and abet Peter Biancamano. Similar criticisms fair or not were voiced in the second ward back in 2011. One imagines Mr. Murray has a perspective on all this. Would it be farfetched to think he's not silently still bleating his lungs out for Ruben Ramos and the Russo faction Carmelo Ticket as seen here in August 2014 when one HHA contract was terminated? Not that anyone in the family's heart beats for the Russo faction Carmelo Ticket. Talking Ed Note: Heaven forbid. Brian Murray, a twice failed candidate for Hoboken's Board of Education on the Carmelo Ticket seen here in August 2014 bleating his lungs out for the very troubled Carmelo Garcia who finally saw his contract in the HHA terminated in a special meeting at City Hall.